✔ Synthetically insulated coating that is designed to replicate the qualities and appearance of down jackets. Made with polyester fibers arranged in different sized filaments and intertwined to trap warmth in air pockets, just like natural down's feathery clusters. ✔ Breathable material that keeps moisture away, making sure your feet stay dry and odorless. No more sweaty/smelly feet. ✔ Podiatrist approved design that maximizes comfort for your feet, even reducing pain for those with chronic foot problems. The memory foam contours to the shape of your feet which helps reduce pressure points and fatigue. ✔ Thermostatic lining that keeps the interior of the slipper at a constant body temperature, perfect for those with cold feet caused by poor circulation. ✔ Smart construction from the durable, anti-skid sole to the static-free, windproof top that resists all kinds of snags and tears. ✔ Epitome of comfort that will keep your feet warm, cozy, and relaxed from the minute you slide into them in the morning, to the last second you take them off before bed. For true comfort at home, you can't go wrong with RockDove slippers. 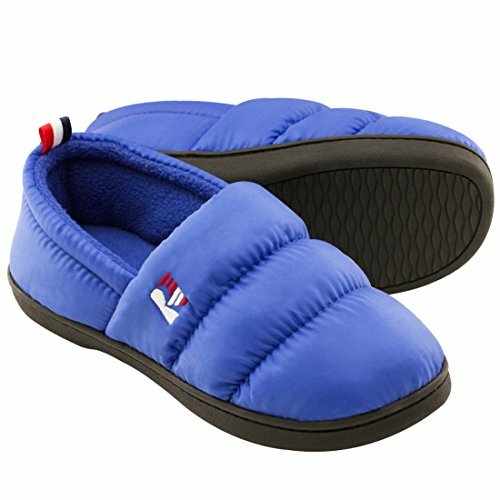 Still looking for the perfect indoor/outdoor slippers? Scroll up and add a pair of RockDove quilted down slippers to your cart today!